Keep sipping fluids during labour to keep hydrated. Some women also enjoy popsicles and ice-chips. You need to have enough energy to sustain you as the average length of labour for first time mothers could be 14 to 20 hours or longer. Before you get to the hospital, you can and should eat whatever your body feels like it needs. Once at the hospital, ask your nurse what you can eat if you are hungry. Your appetite will likely decrease as labour progresses. Entering labour well rested is helpful. Take some time off work before your due date, if possible. This time can be used for relaxation, doing something fun and preparing for birth and bringing baby home . Once labour begins, balance movement with rest when you feel you need it so you will have energy for however long your labour takes. 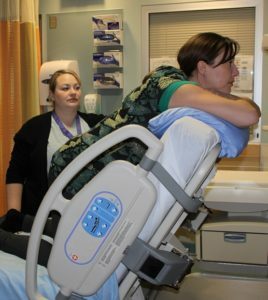 Learn about different positions that can help you rest in labour other than just lying down.